traditional Shetland Ponies racing over a course of miniature hurdles. want them to be good ponies that kids can ride,” said Regina Welsh, USPR founder and director. Center in Washington, D.C. For more information, please visit wihs.org. Horse Show on Barn Night, Oct. 23 and Grand Prix Night, Oct. 25.
charitable organization headquartered in Washington, D.C.
For more information on U.S. Pony Racing LLC, please visit facebook/usponyracing. May 14, 2014, WASHINGTON, D.C. – The Washington International Horse Show (WIHS) is pleased to announce the return of the wildly popular Shetland Pony racing exhibition and launch the WIHS Shetland Pony Steeplechase Championship Series, presented by Charles Owen, which will include a stop at the historic Devon Horse Show in Devon, Pa., plus two nights of racing in Washington, D.C. The WIHS Shetland Pony Steeplechase races are run like professional racing events with a bugler, race caller and photo finish, but the jockeys are youngsters from seven to 14, mounted on traditional Shetland Ponies racing over a course of miniature hurdles. > Learn more about the WIHS Shetland Pony Steeplechase Championship Series. Well-established in England, pony racing is growing in popularity in the U.S., thanks in part to Maryland-based U.S. Pony Racing, LLC (USPR), organizer of the WIHS exhibition series, which about a year ago started running flat and jumping races for Shetland Ponies at racetracks in Maryland, including Pimlico. Charles Owen, sponsor of the inaugural Shetland Pony Steeplechase at Washington last year, will return as sponsor for the expanded 2014 series. No newcomer to pony racing, the Wrexham, England-based helmet maker has been a significant supporter of pony racing in Great Britain since 2005. The first stop in the 2014 series will be Memorial Day, May 26, at the Devon Horse Show, and it culminates with the finals at Verizon Center in Washington, D.C. with races on WIHS Barn Night, Thursday, October 23, and on Grand Prix Night, Saturday, October 25. Additional venues may be added. 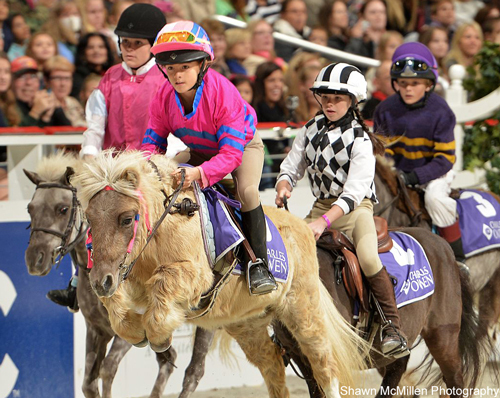 The 56th annual Washington International Horse Show will be held October 21-26, 2014, at Verizon Center in Washington, D.C. For more information, please visit wihs.org. Established in 1958, the Washington International Horse Show attracts more than 26,000 spectators to the six-day show, which includes Olympic-level competition along with community and charity events. More than 500 top horses and riders come to D.C. from all over the globe to jump for nearly half a million dollars in prize money. Event highlights include the Puissance high jump competition, Military Night (Friday), the $125,000 President's Cup Grand Prix, a World Cup qualifier (Saturday night) and Kids' Day (Saturday), a free, fun and educational community event. The Washington International Horse Show Association, Ltd. is a 501(c)(3) nonprofit charitable organization headquartered in Washington, D.C.
For more information about U.S. Pony Racing LLC, please visit facebook/usponyracing.